“I'm not a 'sir', I'm Pandas. Pleased to meet you.” Pandas was only too happy to make amends and quickly had all the arrows gathered up and tucked back in their quiver. Folly paid not the slightest attention however. He continued to scan the rock strewn ground, smiling only when he finally spotted it, and saw it was unbroken. “My nectar wine!” The hippo plopped down on the spot, opened his unbroken flask, and gulped down just enough of its contents to add a blush to his pale cheeks. Such a curious creature would definitely have stirred Pandas interest, were he not so busy. Only when he returned to work did it occur to him that this broad shouldered 'potamus might be the answer to his prayer. After all, he did ask what I was making. 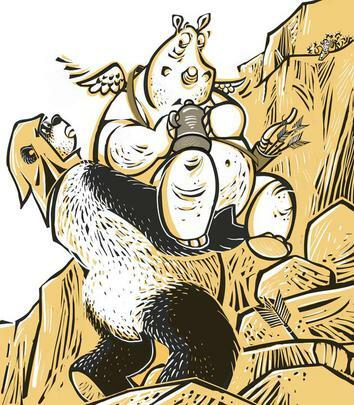 “I'm stacking rocks in order to climb up the face of this cliff and rescue one of my sheep . . .” Pandas explained. “Hard work that . . .” was all Folly said before choosing a suitable rock to squat on while he stole another sip of nectar. He began to mumble and scratch his chin, occasionally punctuating his utterings with a belch or a toot. “Can't . . .” Folly was shaking his head adamantly. Pandas didn't know quite what to do in this kind of situation. He decided a big, comforting bear hug couldn't hurt.